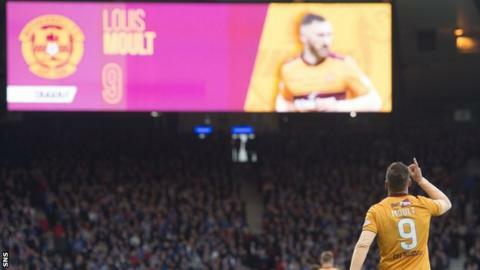 Motherwell hero Louis Moult is convinced his side can beat Celtic in the League Cup final after knocking Rangers out in the semi. The striker hit a second-half double at Hampden on Sunday as Well beat the Ibrox men to make it seven wins from their past nine matches. And when asked if they can beat Celtic, Moult replied: "Of course we can. "We beat them two seasons ago. I scored two goals and we won 2-1 at their place, so we have got belief." Celtic are unbeaten domestically under manager Brendan Rodgers, a run stretching to 60 matches. The holders beat Hibernian 4-2 in the first League Cup semi-final and will be favourites for the final on 26 November. "Yeah, they are a different side now [from the one Well beat], I get that, a different manager and different side. But so are we," Moult said. "You have seen in the past 10-11 games how strong a squad we are, and the big thing for me is our attitude. I genuinely thought we were going to win [against Rangers] and the people beside me believed that also. "Last season if we had gone into that game there would have been doubts, but I firmly believed we were going to cause an upset." Moult, who counts Wrexham and Nuneaton Town among his former sides, took his tally for the season to 11 goals with a stunning first-time lob to make it 2-0 on Sunday. "I love playing in big games, I love playing in front of big crowds, that's what every footballer wants," the 25-year-old added. "I'm hungry for success as an individual and we are as a football club. It's all about feeding the family. I'll run that extra yard to do that. "I'm just happy to play football. I am very lucky and privileged to play for this football club and play football full stop. "I have seen the rock bottom of this game and I don't ever want to go there again, and that's probably why I am so hungry to succeed. I get paid to play football and I enjoy it."